The Annex to Gerlinger Hall housed the new women's gym when it opened in 1969. The severe geometric shape, although veneered with brick, contrasts sharply with the adjacent historic building building. 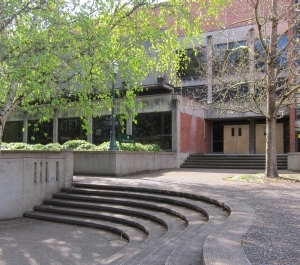 The firm Stafford, Morin, and Longwood also designed UO's Computing Center and the Eugene City Hall (1960-64). The city hall was destroyed in 2015. "Gerlinger Annex, New PE bldg partially in use." Daily Emerald, 10/17/69, 2, 4-5.